Hells Headbangers have announced the release of a new 7"EP titled 'Darkness Manifest' in the lead up to the forthcoming album, Almighty Arcanum. This EP will act as a preview of what is to come with the next full-length and will feature one album track plus an additional track that is exclusive to this release. Both songs were recorded during different sessions to those for the album so they are unique to this release and will be released in a limited pressing that will be available soon. An unholy union is forged between Decaylust (guitars/vocals) & J.Eradicator (drums) which gives birth to a new BLACKDEATH entity, named ERADICATOR. Early rehearsals take place as a 2-piece until later in the year when Chris Volcano joins on drums, allowing J.Eradicator to return to guitars. As momentum builds the band moves forward under the name DENOUNCEMENT PYRE. 'The Storm to End all Wars' demo is recorded in April. Self-released on CD in May (100 copies) and later by Goatowarex on tape (300 copies). Later in the year Blaspherion joins on bass to complete the line-up and the first live performance takes place in Melbourne. Meanwhile the demo spreads rampantly through the underground, attracting the attention of several labels, zines and maniacs alike. 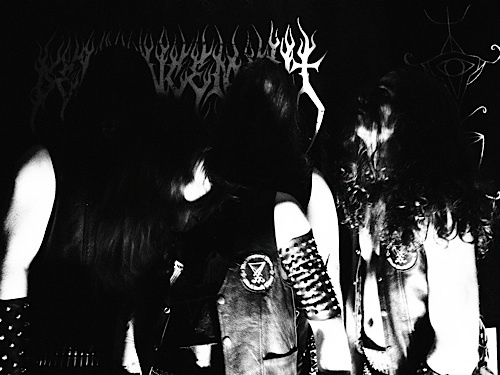 A second demo titled 'Barbaric Vengeance' is released in the form of a live tape recorded during a performance in February. In April a 7"ep titled 'Under the Aegis of Damnation' is recorded. Several more live performances throughout the year including Bloodlust Festival in Sydney. 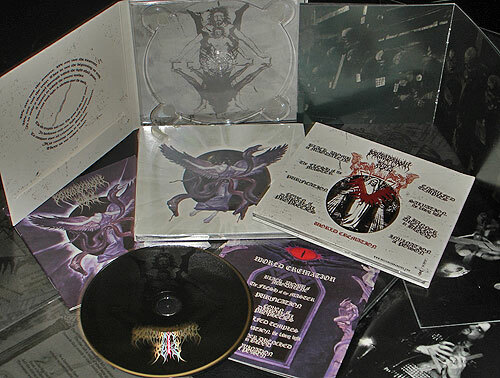 'Under the Aegis of Damnation' is released by Apocalyptor Records in May. Being the last release in the Apocalyptor catalogue, the band moves forth and joins forces with Forgotten Wisdom Productions for the release of a mini-album. Recording takes place in April resulting in the release of 'Hells Infantry' mCD in August. The line-up returns to a 3-piece consisting of Decaylust, Eradicator & Volcano. Early in the year Funeralbitch is summoned on bass to complete the line-up for live shows. Volcano departs in March after a performance at Evil Invaders fest II in Melb. By mid-year J. Eradicator also departs to pursue other avenues. A new deal is forged with Forgotten Wisdom Productions for a vinyl release of 'Hells Infantry'. The tracks are remastered and appear in the form of a split LP titled 'Chaos Rising'. Late in the year Preacher of Doom takes over on drums and work begins on a new 7"ep to be recorded early 2008. 'Chaos Rising' split LP is unleashed early in the year. Also In January 'Circle of the Black Flame' 7"ep is recorded in the Incubator Death Chambers and released in September. Work begins on the full-length CD/LP to be titled 'World Cremation'. InVotan joins the ranks on drums. The Storm to End all Wars demo & Hells Infantry mini-album are re-issued on tape. Most of the year is spent in intense rehearsal for the upcoming album. Recording of the full-length World Cremation commences in October. Album recording finished in Feb. A new pact is forged with Hells Headbangers (USA) for the release of the first album in August. There are no live performances planned for the future. live on in doom . . .